Reading the July issue of South Carolina Sportsman Magazine, Sumter's Dalton Reames took great interest in Phillip Gentry's article entitled 'B's in Your Bonnet.' Gentry's article is about catching bonnethead sharks in the Charleston area. 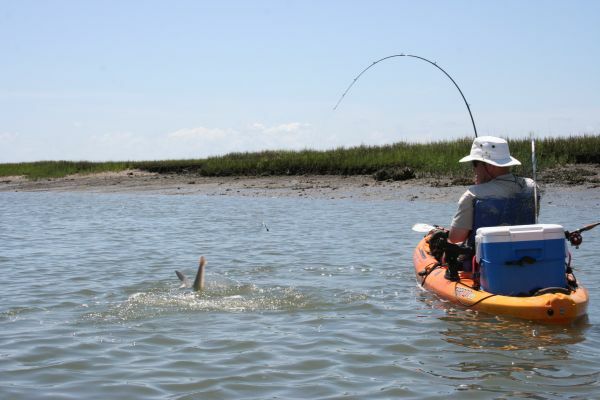 Reames, who kayak fishes in Beaufort's waters, decided to take Gentry's tactics farther south, and to try them from his Wilderness Systems Tarpon 120 kayak. It paid off for him, helping him catch his biggest shark yet that took him about 20 minutes to land with his Abu Garcia 6500 Rocket. A Carolina-rig with wire leader and 3/0 hook was the business end of Reames' gear. He was using shrimp as bait, and the bonnethead was released.